FCS: Well, let's go with the gut reactions of a beginner... White 1 seems nice to me because it necessitates a black reply at 2, and so keeps sente. It also creates a diamond and connects White's territory on the left and right a little more. This is small (4 points?) sente for White but large (12 points?) sente for Black. 1 point gote for both. Black needs another move before he can play here, as it is it is 1 point gote for White. The lower black group doesn't entirely seem alive to me, but I cannot see a way of killing it. However, d is definitely sente to kill the group through ko, I think. 1 point gote for either. 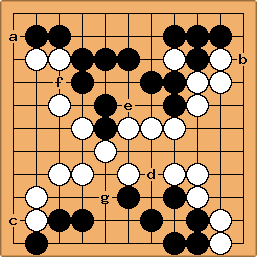 1 point gote for White, sente for Black. 1 point sente for white, gote for Black. Note by HolIgor. I am not ready to post my variation yet. Maximum I got was 7 points for White. But I can criticize others though. In the diagram above Black 6 should be at a, then 7, and sooner or later White is forced to defend a point at b. I don't think white would play 7 and fight a ko. Point c is exposed to White's attack too. MortenPahle: Don't know what I was thinking leaving c :~/ But, more to the point, why would White answer Black 6 at a by filling the ko? 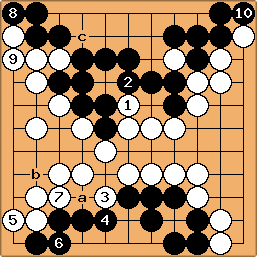 The ko has no value except for a half-point in gote? Circled points are dame. 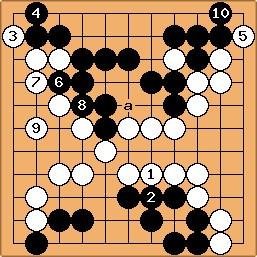 That leaves White with 30 points of territory and Black with 20 + 1 prisoner, i.e. White wins with 9. However, I have great difficulty in assessing the size of the moves, and the right sequence of play, so I'm sure that this is not optimal.